A horrific crash at Daytona Saturday afternoon sent more than a dozen fans to the hospital. The drivers involved walked away — almost unbelievably so in the case of rookie Kyle Larson, who emerged from less than half of his car after the rest went into the fence and the grandstand. It also sent a lot of fans to social media with video and stills of the crash and its aftermath; many of them taken as eyewitnesses from the grandstands where the wreckage landed. Tyler Andersen, who describes himself on Twitter as a sophomore at Providence, posted a video that captured the whole sequence, including a tire that spun into nearby seats injuring someone near him and efforts to get assistance. 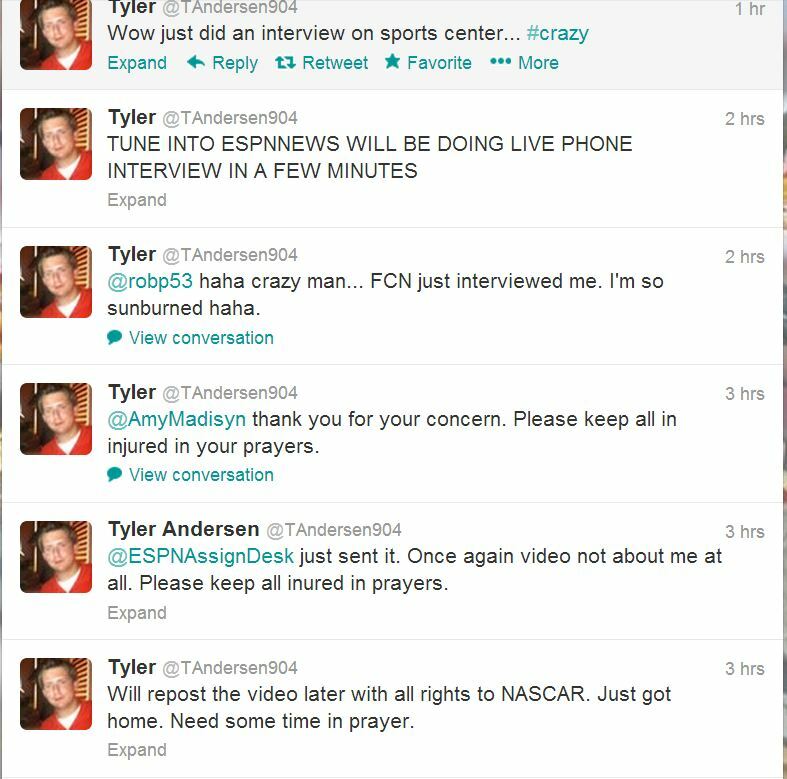 He asked for prayers for the injured man before alerting ESPN to the video. Andersen’s video quickly ricocheted, recommended to me by disparate parts of my timeline. I watched it once and when I went back to check something minutes later, it was gone. 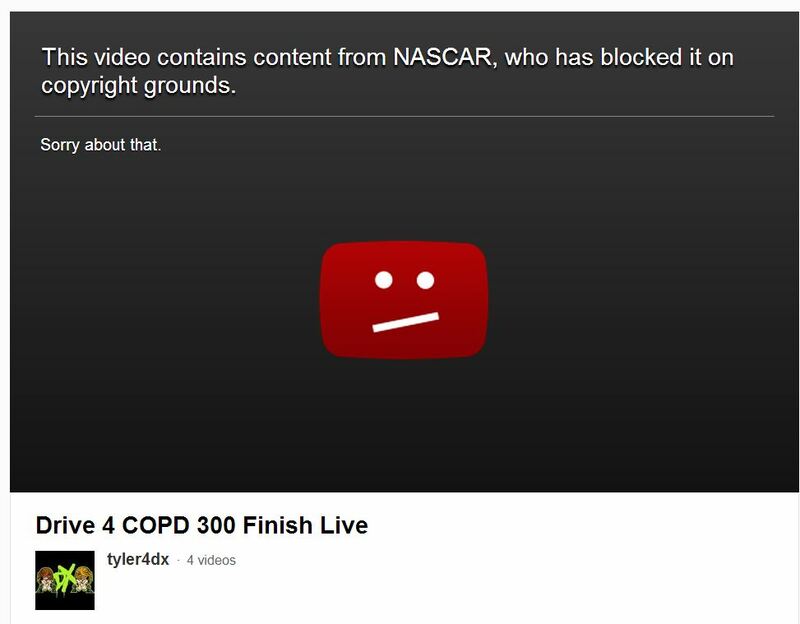 I don’t know if this was the automated YouTube copyright police at work or if it was taken down because NASCAR or a media rightsholder complained. If it was the former, NASCAR has a sophisticated enough social media operation to know that the video was yanked and should be back up. If it was the latter, NASCAR has a sophisticated enough social media operation to know that rights or no rights, the video wasn’t going away and they might as well avoid the criticism of it. Instead, news video taken by someone who narrowly missed being injured) was blocked — and as of this writing is still blocked. Meanwhile, Deadspin (of course, it was Deadspin), smartly grabbed a copy of the video and popped it right up. Yes, NASCAR owns the copyright, something spelled out on tickets to races just as it is for many other events. (There are legal concerns here; I expect all of the video, stills and other records could be evidence in any case emerging from the crash.) And I can understand setting up rules applying it to live streaming or layering in length limits. And I’m not encouraging any fan to take video or pictures at personal risk or to do it instead of helping those around them if that is possible. Taking high-quality images and instantly sharing them is only getting easier. If NASCAR wants the boost from social media, as it clearly does given its interaction on Twitter, Facebook and other places, it should go all in. Work with media partners to encourage fans to share video and pictures. Avoid knee jerk reactions and keep an eye out for response to automated takedowns. Narrow the parameters for takedowns. Be as inclusive and as engaged as possible. Give your team the power to respond quickly and make sure a high-level exec is available for quick high-impact decisions, espcially during events. And always remember: you can’t control the internet or social media. You only think you can.
.@nascar Strongly urge you to unblock fan video of Daytona crash. If you want the boost from social media, need to take it all. Update: As I was posting this, The Verge published a statement from NASCAR that it took down the video out of respect for those injured. Information on the status of those fans was unclear and the decision was made to err on the side of caution with this very serious incident. Can fully understand why NASCAR took the video down. Meant no disrespect to any involved. Once again, keep all affected in your prayers. Our partners and users do not have the right to take down videos from YouTube unless they contain content which is copyright infringing, which is why we have reinstated the videos. Will NASCAR try the copyright block again using the language on the ticket that claims it owns all rights? I hope not. Will other copyright owners get the message from YouTube that takedowns aren’t an accepted method of trying to control the flow of information? I doubt it.